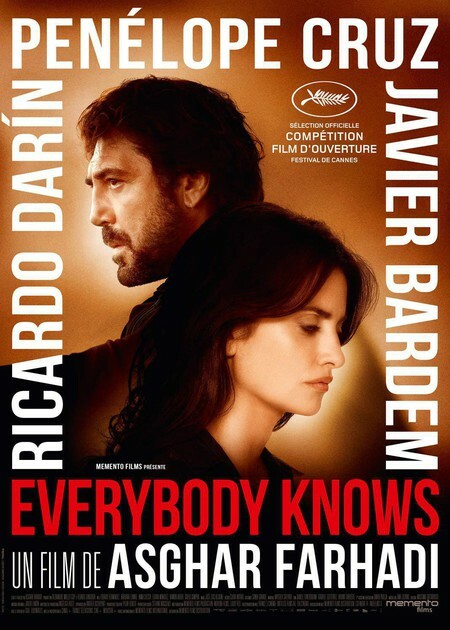 TUTTI LO SANNO (EVERYBODY KNOWS) - V.O.S. Trama: The Cannes opener (in competition) was directed by Iranian filmmaker Asghar Farhadi ('A Separation') and stars Penelope Cruz and Javier Bardem.Extended families, class differences, children being crushed underfoot (mostly metaphorically), long-ago secrets that reluctantly float to the surface — on paper, Everybody Knows (Todos lo saben) has the classic ingredients of the best work of Asghar Farhadi, who won Oscars for his Iranian dramas A Separation and The Salesman and who earlier worked in a foreign language in The Past, with Berenice Bejo and Tahar Rahim. The film follows Laura (Cruz) on her travels from Argentina to her small home town in Spain for her sister's wedding, bringing her two children along for the occasion. Amid the joyful reunion and festivities, the eldest daughter is abducted. In the tense days that follow, various family and community tensions surface and deeply hidden secrets are revealed. Trama: The Cannes opener (in competition) was directed by Iranian filmmaker Asghar Farhadi ('a Separation') and stars Penelope Cruz and Javier Bardem. Extended families, class differences, children being crushed underfoot (mostly metaphorically), long-ago secrets that reluctantly float to the surface — on paper, Everybody Knows (todos lo saben) has the classic ingredients of the best work of Asghar Farhadi, who won Oscars for his Iranian dramas a Separation and The Salesman and who earlier worked in a foreign language in The Past, with Berenice Bejo and Tahar Rahim. The film follows Laura (cruz) on her travels from Argentina to her small home town in Spain for her sister's wedding, bringing her two children along for the occasion. Amid the joyful reunion and festivities, the eldest daughter is abducted. In the tense days that follow, various family and community tensions surface and deeply hidden secrets are revealed.